← Relationship: My Man–My King! We have come to the place that who we are is based on our vulnerabilities and what we do is limited to our insecurities. This is not the way to be, nor is it very effective. Handling our relationships from these feelings, may allow us to experience some level of self protection, but we fail to create the security for our partner and in our relationship. This actually backfires on us. 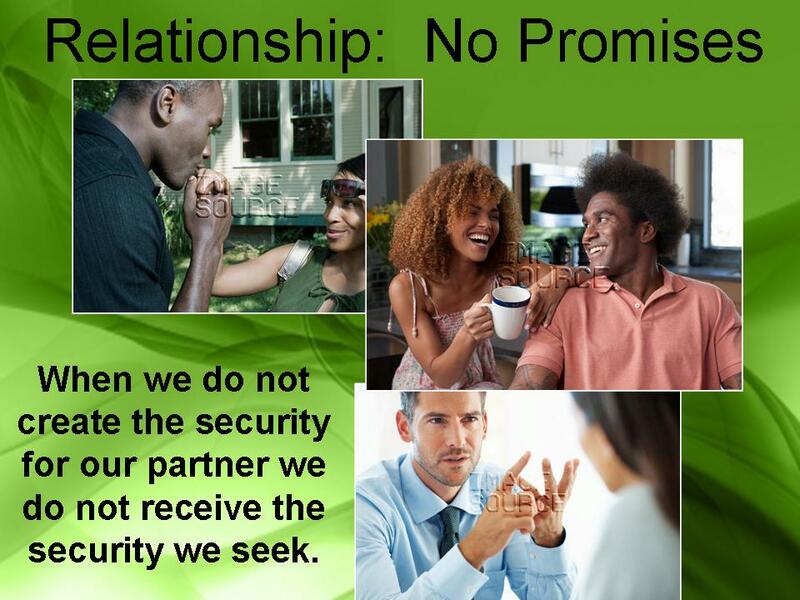 When we do not create the security for our partner we do not receive the security we seek. We seek security in a relationship and rightly so. We want to know that the one we Love will be there for the rest of our lives. In the need for security, we fail to take action to secure it. We don’t work for it. We barely do anything, and we become at ease, yet thinking we are doing everything. An objective look at the result of our actions is a sure sign of how we are doing. If the results are working against us— we are not doing very well. Positive results validate that we are doing something right. We fail to effectively do our part to keep our relationship secure by providing the emotional, intimacy, sexual, and loyal security. We do not put much focus on strengthening these areas. They only become important when someone has violated or rocked the boat of security. These should be strengthened daily. Call it preventive maintenance. We should provide the best of ourselves, without feeling vulnerable. When you have some depth to yourself in the areas of history, self awareness, intelligence, progression and higher consciousness, there are many levels to work with. We are like an onion, use the layers. Providing partner security is like when we try to ensure job security— by giving an employer our best work. There is nothing too vulnerable about that. A relationship is no different. We believe we are self protecting when we hold back on making a deeper and more meaningful partner connection. Can we protect and connect on a deeper level? No. Being hurt before is a pain we don’t want to feel again, but this is also self damaging. The only way to be, is true to self. Otherwise, we are a living facade. Our partner knows when we are holding back. This in turn forces him/her to react to us by self protecting from us. No one will open up to anyone whom they can feel are holding back. Holding back leaves a wide gap of unlimited possibilities of why we could be holding back. The biggest “why” is we might be holding a secret. Another big “why” is we are holding out for someone else. Now we are both holding back, and putting the relationship very far from the feeling of security. We cannot get lifetime promises on a partial commitment. We want a commitment we must give it. You may be thinking, “Why should I make a commitment and my partner may pull back on his/her commitment”? This may very well be true……. Keep up your guard for your heart. But work to create a feeling of security that is comfortable for both you and your partner. Share something that was painful about a situation in your past. Explain why it was painful and if the pain is still there. If it is not still there, share how you overcame the pain with emotional wellness. Start there. Take out the time to share a piece of yourself. Ask your partner to do the same. Ask questions. Be intuitive of certain reactions and ask why a particular reaction was a bit edgy or if a reaction appeared to be painful to your partner. Create moments of emotional intimacy where you are both calm, and relaxed, so the environment allows an atmosphere of comfortable conversation. Try not to argue on things that are trivial. If the small problem will not make a difference down the road, write it off, like you would a stupid person. This keeps your relational environment from being hostile, stiff and distant. Be a partner where you can be told something without you judging, and be able to keep a secret. More importantly, be a partner where what was told to you, you hold it, and not use it as ammunition later. Violate any of these, and your partner will be on guard at all times. When you feel a pull, or any form of resistance from your partner (provided you are not paranoid, consumed with jealousy or dare I say delusional?) focus your attention on your partner and create a comfort level so your partner can and wants to talk to you. If you want security don’t breach your relationship. Be trustworthy. Be someone your partner can depend on. If you have violated that trust, then work like you only have a day to live every day until you make it right. Learn how to make things right. Don’t expect things to just get right. If you want a lifetime promise, work for it. It is not granted, and you are not entitled— even if you are married. Being married does not mean your relationship is safe just by sharing the last name, nor have you arrived. If you think you have, your relationship needs some work. Everyone wants someone to talk to and depend on. Everyone wants someone to share their deepest secrets and pain. The reason why we share our most private thoughts with someone, is because they have given us an open door and makes us feel safe and comfortable, regardless of what we have done or said. You want promises? Find ways to comfortably provide them. This entry was posted in Fix Yourself and tagged a committed relationship, confirming a commitment in the relationship, partner committed, promises in a relationship, why won't a partner commit. Bookmark the permalink.